If you are like me this holiday season, the one thing you've been completely out of is, TIME! This is a really fast and easy look using one of my favorite colors! I like to use a shimmery, glittery jewel tone for the main color, just because it's a tad bit more dramatic, but you can really use any color you like! ♥ Nyx Jumbo pencil to lid patted on with finger. Messy is ok! 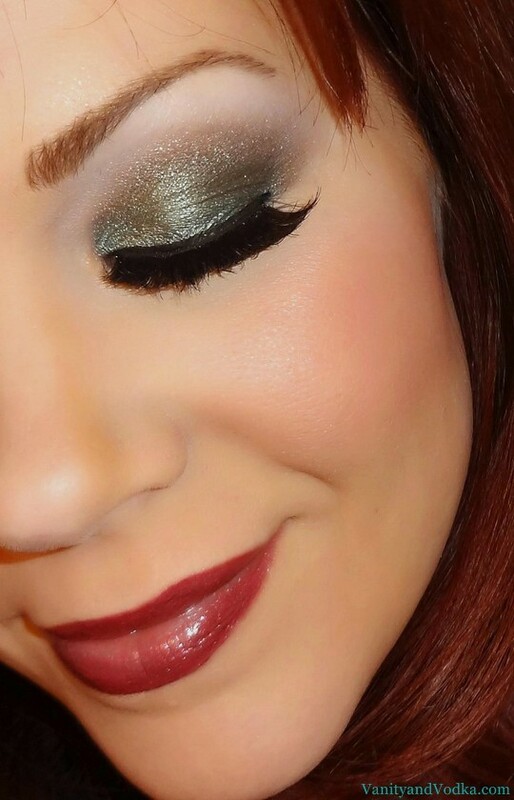 ♥ Bronze shadow to crease to blend it all together. I used Rimmel Spicy Bronze. ♥ Mascara, eyeliner, lashes (optional). I used Red Cherry 76's. ♥ Disney Villains Lip Gloss in Evil Queen. It's a beautiful deep plum that I love! Hope you are all doing well and having a wonderful holiday season! Many blessings to you and yours this year :-) Thank you so much for stopping by. It truly means the world to me. YAY!! Glad you like it, Traci! Wow such a pretty holiday look. I am in love with those lashes girl! Pretty colors! Really very festive :) you are a gorgeous girl! Aww thanks, Janine!! You are so sweet!! Thank you so much, sweetpea!! :-) xoxo! Lovely, the lashes look amazing on you! Awesome! Then I will wear them ALL THE TIME! Ha ha!! Thank you so much, Kayla! stinkin gorgeous as always! You do the best looks! Jordan you are so sweet to say! Thank you! I would love nothing more!!! I'm so glad you like it!! You are hilarious- you know I am a shopaholic, right? Haha!! I have to admit, there are such treasures on Etsy! Natural, cruelty free, pigmented colors that are so affordable. Absolute goldmine!! I would be honored to do your makeup! Seriously... would we get anything done, or would it be a slumber party of awesomeness?? Shoot! Let's invite everyone!! Thank you so much. For everything. I'm blowing those kisses and rainbows right back to you. Thank you for being there! oh my, i love your make up! i'm really not a make up kind of girl but i do appreciate girls who know how to put them on well.. and whenever i do appply some on my face, i'm usually focusing on the eyes. this is something i'll try out for sure the next time i attend a party! I'm so glad you like it! Yes, this is an easy look that is super pretty for a party! :-) Thank you! Great look; you look stunning; love it! Your lashes look GREAT! you should do a how to apply video. Wow lady, that eyeshadow shade suits your skin color and your hair so well, I'm jealous! Not to mention that you look absolutely stunning, and I love the lashes! This look is sooo pretty I love it! YAY Thank you! So glad you love it! OMG that looks soooooo pretty! love your blog and makeup looks!! !